— This article by Jerry Cates and Sheri, first published on 20 February 2010, was last revised on 23 April 2016. © Bugsinthenews Vol. 11:02(09). Attached was a single photo of what appeared to be a spider, on the inside surface of something outdoors. I enlarged the photo and cropped it, as shown below. Then the photo was converted to a black and white image and printed out, so it could be made into a line drawing, as shown to the right of the photo. The interesting thing about this spider is its long legs, particularly legs I, II, and IV (leg III is of normal length). Before continuing, perhaps it should be explained why Sheri’s photo is even being posted here. What can be determined from so blurry a photo? Is it even worth the effort? Answer: much, and yes. This spider is no ordinary arachnid, and that much can be said from just a glance at Sheri’s blurry, out of focus photograph. As with all the photographs I receive, every effort is made to learn as much as possible, even with media that are not ideal. Minimal cue analysis is surprisingly useful, once you get the hang of it. Sometimes, of course, it fails by leading me into a false identification, but even then much is learned. And that is what life is about: making mistakes, and learning from them. Never fear making a mistake. Worry, instead, that you might miss a learning opportunity by being too cautious. Notice, for one thing, that six of its eight legs are very long and skinny. 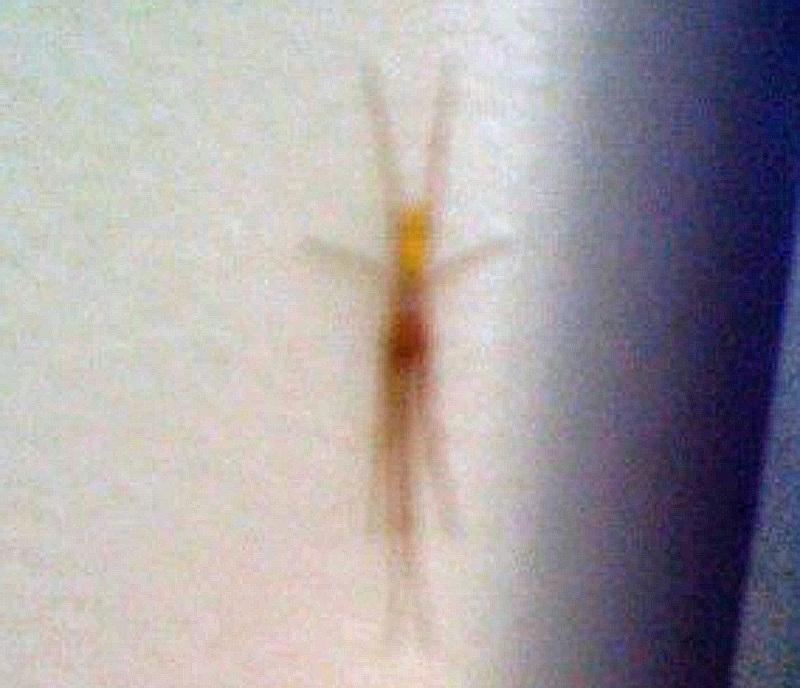 Two of these legs, at one end of the spider’s body (in the bottom of the photograph) are extremely long, and stretch out longitudinally, directly in line with the body. These legs are flanked by two other legs that are about the same length as, and are positioned almost identically to, the two legs at the very opposite end of the spider’s body (in the upper portion of the photograph). The remaining two legs, which appear much shorter than the other six, are positioned so that they stretch latitudinally, rather than along the long axis of the spider’s body. It so happens that this leg arrangement, assumed when the spider is disturbed, is generally diagnostic of certain members of one family of spiders in particular, the Tetragnathidae, or the longjawed orbweavers (sometimes known, colloquially, as “stretch spiders,” because their faculty for positioning their legs in this manner allows them tostretch their bodies along tree limbs and twigs, as a means of hiding from predators). It is also a leg arrangement that–at least to the best of my knowledge–is never observed with spiders in any of the other families. There are, of course, other spiders with extraordinarily long legs. For example, the cellar spiders, also known as daddylonglegs, in the Pholcidae family, come to mind. These latter spiders even arrange their legs at rest so that four are stretched out to the front, and four are stretched out to to the back. But all eight of their legs are about the same length, and one never sees the stark linearity in the way the legs are stretched out that is seen in the Tetragnathidae, mostly because the Pholcidae reside in dome sheet webs or other kinds of webs that are placed in dark, obscure corners, in caves, and in similar locations where hiding from predators is secondary to trapping and consuming prey. Now that we have concluded that this is a tetragnathid, which end is which? Well, it so happens that Leg I (the pair of legs closest to the face) of spiders in this family is always longer than any of the other legs. That means this spider is facing downward in the photo, and the legs are numbered as shown in the line drawing at left. The yellowish body part in the upper portion of the photograph is, therefore, the abdomen (which, in the tetragnathids, is either oval or worm-shaped; we observe that the abdomen in this specimen is the latter form, and appears to be at least twice as long as it is wide, and that tells us something useful about the spider’s identity). The darker portion in the middle of the spider’s body is the cephalothorax, consisting of the cephalic (head) and thoracic (chest) regions where, underneath, the legs attach. Finally, the even darker portion forward of the cephalothorax is where we would expect to find the chelicerae, or jaws, which in this family are sometimes ordinary as with other spiders, or quite large, often unusually so, especially for males. This specimen appears to sport unusually large chelicerae, as the darkest portion of the body appears to be almost as extensive as the cephalothorax. Again, this tells us something useful about the spider’s identity. We can make an intelligent guess that this spider is a male, as it is almost always the males in this family that have the largest chelicerae. The males also sport conspicuously swollen palps (diminutive leg-like appendages that stretch outward from the face) that would add to the perception of largesse anterior of the cephalothorax in this photo. 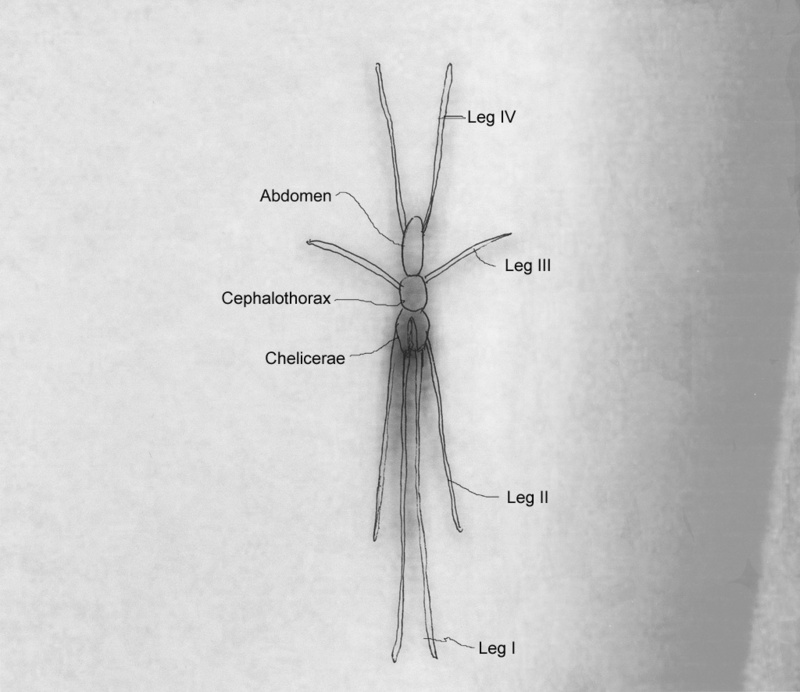 We can also make an intelligent guess about genre, because only the genus Tetragnatha (yes, the generic name is almost identical to that of the family name) have both a worm-shaped abdomen at least twice as long as it is wide, and unusually enlarged chelicerae. This genus is represented by fifteen species in North America. Spiders in the Tetragnathidae are venomous (you may be aware that almost all spiders are, and the Tetragnathidae are no different). However, though they will bite if provoked, and the wounds produced thereby are known to persist for days or weeks as small, swollen welts, their bites are not normally considered medically significant. Tetragnathids can congregate in large numbers in docks and marinas, where they often come into contact with dock workers and boatowners. Though bites by these spiders are common under such circumstances, they only rarely produce wounds more troublesome than might be consistent with a sore pimple, and the wound rarely lasts more than a few days before healing.